Ogden Park opened to the public in 1905, as an innovative site providing relief from tenement living that sparked the development of other social properties across the country. One hundred years later, the family-centric design reconnects the park to its changing community, encourages visitation and enriches the Olmsted Brothers and Burnham’s original social program. 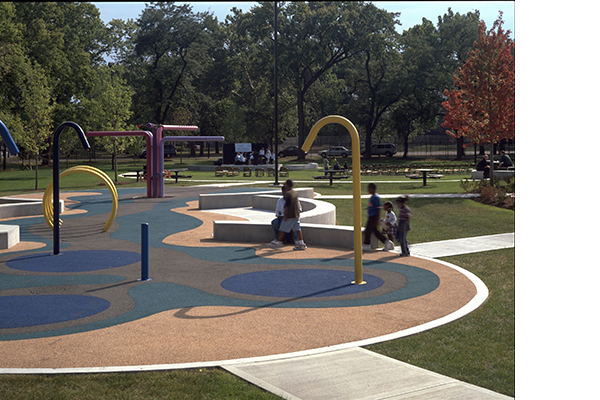 Now located across the street from a public elementary school, it was critical to create a playground and outdoor learning space conducive to after school programs as well the park district’s summer camps. Community-based design workshops led to a program that meets adult needs and offers families a more diverse range of activities, from an open-ended storytelling quilt to barbecue grills. Children feel safe and welcomed. New play equipment was installed along with an interactive water feature that cools everyone off on hot summer days and a canopied 12-horse carousel that offers free rides for all visitors. A really big garden chair compliments the classically styled field house and is perfect for narrating storytellers or for children to climb up into. There is plenty of room to gather around, to rest, and to study the natural landscape just peeking through the opening in the storytelling quilt. 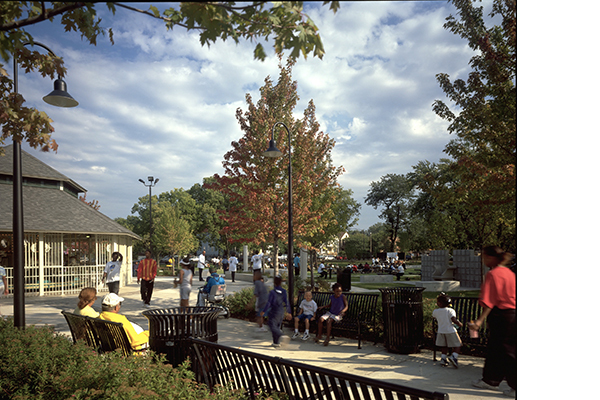 Ogden Park is an American Society of Landscape Architect’s Merit Award winner for its simple, yet elegant design approach. Architecture, Exhibit Design & Interpretive Programming: Architecture Is Fun, Inc. Engineers: Louis Jones Enterprises, Inc. & Fisher + Horos Structural Engineers, Inc.